The national anthem of Bangladesh, penned by Tagore, is not exclusively sung on one side of the fence, neither is its use stringently limited for the national occasions of Bangladesh. Unlike the national anthem of most nations, Bangladesh’s national anthem has an everyday appeal in its core that keeps it alive amid the unremarkable occasions, especially in West Bengal where it does not get limited by its officialdom. On the auspicious eve of this year’s international language day (21st February), West Bengal’s delegation team in Bangladesh found themselves at the eye of an undesirable controversy. The delegation team, led by Chief Minister Mamata Banerjee, was to take part in the celebration of ‘Bhashadibas’ (Language day), marked in the consciousness of everyone sharing the lingual identity of Bengali. The controversy was riled up by a faux pas made by Indaneel Sen, a famous singer of West Bengal and one of the team-members of the West Bengal delegates, who started to sing the national anthem of Bangladesh from the middle. Since it was against the protocol, someone asked the singer to stop and start from the beginning. Mamata Banerjee, who has a knack of getting tangled into one faux pas after another, quickly handled the situation by inviting everyone to sing the national anthem together. Though she somewhat saved the face of Sen, her new party-recruit, the cat was already out of the bag. The national anthem of Bangladesh, penned by Tagore, is not exclusively sung on one side of the fence, neither is its use stringently limited for the national occasions of Bangladesh. Unlike the national anthem of most nations, Bangladesh’s national anthem has an everyday appeal in its core that keeps it alive amid the unremarkable occasions, especially in West Bengal where it does not get limited by its officialdom. While it is inconceivable to hear someone singing ‘Janaganamana’ or ‘Pak sar jameen sad bad’ just for their aesthetic appeal and not for their official purpose, the same cannot be said about Bangladesh’s national anthem. So from Sen’s point of view, it was not a heresy to try to begin the song from the middle or to personalise its artistry. Tagore, to an extent, is personalised by every soul in Bengal in both side of the border and there was nothing wrong with that. However, one’s struggles often alter one’s vision. 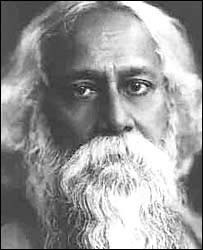 Unlike their counterpart in West Bengal, the Bangladeshi brethren struggled and bled, not only for the shared language but for Tagore as well. How they kept Tagore in their midst, how under Pakistani rule they painted a partial picture of Tagore as a ‘Unitarian Brahma’ and not a polytheistic Hindu (although Tagore wrote songs about idolatry), how the struggle for their own tongue was mired with Tagore’s writings, is a different captivating story altogether. But suffice it to say that because of the different struggles (or lack of it) that both sides of the fence went through, in spite of their shared lingual and cultural identity, there is a rift that is widening every day, to an extent that our individual struggles seem alien to one another. Shahbag (movement in Dhaka) and Hokkalorab (student agitation in Kolkata) remain as distant as they can, without any possibility of a bridge in between. The relation between state and its private citizen remains an intriguing one. A nascent state is, more often than not, the most zealous one. And if that state is ruling a society that has historically been more comfortable under the rule of communities, religious or otherwise, then it takes time for the emergent state to test the water, to set its limit, to understand its authority and strength. It is not just a case of classic overcompensation as sometimes the state has no choice but to be forceful to disrupt the long-standing societal hegemony. But in its effort, it cannot but deify itself. Like most other post-colonial societies, subcontinent is yet another stage where we see this experiment of democracy going on. Bangladesh, like other states of subcontinent, is young and brittle. The fragility of Indian union or Pakistan becomes evident through all their cracks and fissures whenever communal forces attempt to subvert the state authority, and Bangladesh is no different. Such a state always tries to reinforce its authorities through protocols. How the national anthem is sung or how the national flag is maintained, become very important for a state that is not very certain of its powers and limits, and this is then reflected in action of citizens. The exposition of such a protocol was Jindal versus Union of India that starkly showed the attempt of the state to enforce its authority. So it is understandable why a group of citizens of Bangladesh, that have already witnessed attempts to undermine it, would react strongly to the different rendition of their national anthem as the anthem becomes something beyond a protocol. It becomes one of the emblems that must not be undermined. But the state actor of both the Bengals and their irrevocable difference is not the principal focus. The focus remains at the growing alienation of two Bengals, who speak the same tongue, but communicates through different languages. The author is a medical doctor and former independent student activist of Kolkata, currently a doctoral researcher at Rutgers University, New Jersey.